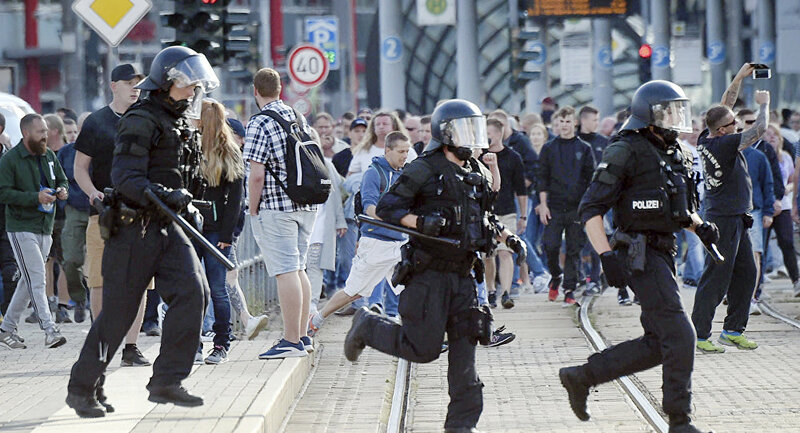 Hundreds of people flooded the streets of the Saxon city of Chemnitz on August 26 following the death of a German man, who was allegedly killed in a fight with immigrants during a festival. While right-leaning activists are calling for new demonstrations online, and the local police are preparing themselves for a new wave of anti-migrant marches. The District court of Chemnitz has issued an arrest warrant for a 23-year-old Syrian and a 22-year-old Iraqi who are suspected of killing a 35-year-old German man in the early hours of August 26, which triggered anti-migrant protests in Chemnitz. The city attorney's office has requested to arrest the suspects, who reportedly stabbed the man to death without any justification following a verbal dispute on Sunday night.They were detained on August 26 by the police, who are looking into motives and circumstances of the crime, according to the previously issued statement. According to the media reports, the victim, Daniel Hillig, was stabbed some 25 times and died in hospital. He's said to have been a local resident of German-Cuban origin, who was a trained carpenter. Two of his friends were also seriously injured and admitted to hospital. The authorities earlier called the incident a "dispute between several people of different nationalities." The police were initially reluctant to release information about the suspects, including their nationality. The brawl occurred during the city fest. Information has been circulating online that the Germans tried to stand up for a woman who was being harassed. However, the police reported on Twitter, the investigation had found “no indications" yet that the conflict was preceded by harassment and called on people not to spread the speculations. With vague reports from the police, hundreds of protesters took to the streets of Chemnitz on August 26. Around 100 people gathered in one of the city squares to mourn the victim. Chemnitz: Hundreds of people saying goodbye in mourning. — B. Frieling-Bailey (@frielingbailey) 26 августа 2018 г. — Chronik gegen Rechts (@Chronik_ge_Re) 26 августа 2018 г. Around 1,000 people subsequently took part in protests. Some of them were identified were reportedly shouting anti-migrant slogans and chanting, "We are the people," as well as "offending foreigners." The counter-demonstrators were also taken to the streets. Extra-forces of police have been deployed. — Niemiecka Polityka (@NiemieckaPolity) 26 августа 2018 г. #Chemnitz, #Germany, 26 August 2018: ~1000 neonazis hunt refugees and immigrants, attacking who does not look sufficiently german. The far-right riding hate is now near of being the 2nd party. — rui borges (@homo_viator) 27 августа 2018 г.
Additionally, calls for revenge have been circulating online. Following the events, a video emerged on which a group of men allegedly attacked two foreigners. — Ali Özkök — علي أزكوك (@Ozkok_) 27 августа 2018 г. Commenting on the protests, government spokesman Steffen Seibert said, adding "we will not accept such gatherings, hunting people of different appearance, of other origin, down or the attempt to spread hatred on the streets." The anti-Islamization movement PEGIDA has urged locals to continue protests in Chemnitz following the murder of the 35-year-old German. "Muster strength from anger and sadness! Only together can we ensure that his death was not pointless," the regional branch of the movement posted the calls for the August 26 demonstration on their Facebook page. Similar urges are also spread through football fans’ groups on social media.. The police are preparing for further deployment, and have told the German outlet Franfurter Allgemeine Zeitung that they take the demonstration seriously.